Farmersgirl Kitchen: He stuck a feather in his cap and called it macaroni! 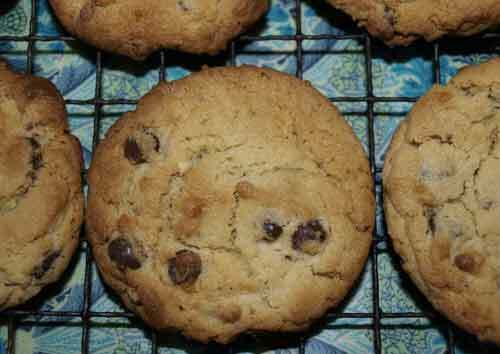 Yesterday I made some more Peanut Butter and Chocolate Chip Cookies. This time I did give them a little bit of shaping (with my fingers) but just a gentle pat and they came out more rounded. I think these may become my signature cookie! I also made macaroni and cheese ( I refuse to call it mac-n-cheese) something that we rarely eat because of the high fat content, however I was in the mood for something like this. It's made with Lockerbie Cheddar, our local cheese. Scottish Cheddar can be either red or white, but somehow, for me, macaroni and cheese should always be a nice orangey colour lol! I added chopped up cold ham to the mix and some cherry toms on the top before an extra layer of grated cheddar. I'm not going to post a recipe, I didn't use one and it's only a white sauce with cheese and a bit of mustard powder in it mixed with boiled pasta. It was delicious, though I say it myself. Looks great Janice. I'm not fond of macaroni cheese but Hubby loves it so I think I'll have to make him a batch sometime soon. They both look lovely - I wouldn't have thought to put peanut butter into the mix but it's a great idea. Love the cookies. It's late but I don't mind to sneak some to bed to eat :P The macaroni and cheese looks delicious, too. Everyone needs a signature cookie! :D These did come out beautifully. 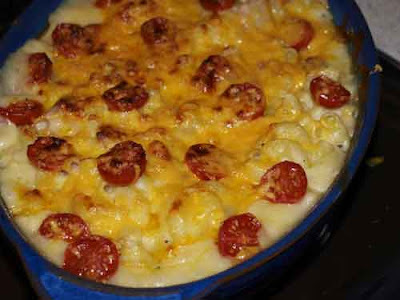 Your macaroni and cheese looks scrumptious as well!